Latterly, Massey double deck bodies adopted a much squarer outline than the curvy designs of previously, giving them a less stylish but nonetheless quite purposeful air. Here we see one of Wigan Corporation’s final batch of so-equipped PD2’s, about to depart the town’s bus station for Wrightington Hospital, whilst a flock of archetypal bus station pigeons hover in the background. What is it about pigeons and bus stations? It’s interesting that this is the first appearance of a Wigan bus in the column on the left. For such a proud operator – look, no external adverts! – I’d have expected others to have got in before you, John. Thanks for posting. Wigan and Leigh, having both avoided the dreaded SELNEC were appalled at the thought they should both fall into the renamed PTE’s clutches by being absorbed into the new County of Greater Manchester. It’s very timely in view of yesterday’s FA cup result! Did our editor have his crystal ball polished specially while deciding when to post it? In Wigan bus station it was all about pecking the crumbs left by the Pie Eaters!! Well done Wigan on winning the Cup – now just ensure you stay up so the town truly becomes a first rate two sport venue. Oh, nearly forgot, the PD2. That front dome is very heavy – almost in the same league as Alexander’s Balloon Roof dome. The curvy designs were seen as dated by the late 1960s and the more upright front profile mirrors Manchester’s attempts with its Burlingham and MCW Orion bodied PD2s. Actually Pete, Leigh Corporation passed into SELNEC (Northern) with all the others in 1969. Only Wigan suffered as a result of the l974 fiasco. The front spot/fog light is situated in an unusual position. 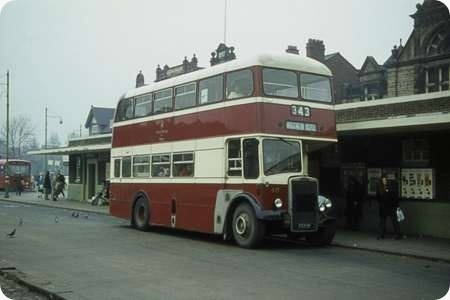 I assume the route to Wrightington Hospital was joint with Ribble – being numbered 343. Was Wigan the last operator to continue with coloured "identifier" lights? James (of Ammanford) used a single green light mounted under the canopy on half-cabs and outside the front near-side windscreen of underfloor single-deckers, the last being so fitted were its 1957 Tiger Cubs. Were there any other users between 1957 and 1974? Yes, Philip, the 343 was joint with Ribble. A similar one, the 333, showed DANGEROUS CORNER on some blinds. I trust the drivers took suitable precautions! This route was one I used often when living in Wrightington. It was joint with Ribble but each operator actually took a slightly different route. The Wigan version took a direct route while the Ribble version went under a low railway bridge which meant that it was always single decked. At the time I was using it these were Ribble’s iconic 36ft Leopards. This version of the service was numbered 333. Chris, did you find that the Ribble buses were governed so their top speed was around 30 mph? Frustrating if the bus was running late. There must have been a time when Wigan Corporation vehicles appeared on the 333 as I can remember seeing a photo (in BBF6, I think) of a Tiger Cub standing on the then Wigan Bus Station displaying the famous destination ‘333 Dangerous Corner’. My memory says that the route was extended to Wrightington Hospital in the early 1960s and the destination ‘Dangerous Corner’ ceased to be used. There could well have been periods when only Ribble vehicles appeared on the 333, but it would have remained technically ‘joint’ of course. Wigan was one of a group of North West municipal operators who reverted to the Leyland exposed radiator after previously having deliveries of Titans with both the BMMO and St Helens style ‘tin fronts’. Stockport and Ramsbottom were the others that come to mind. Another interesting feature of the Wigan fleet was of course the unfathomable fleet numbering system. In the Ian Allan BBF’s the registration numbers were used to define the batches of vehicles with the fleet numbers being allocated in what appeared to be a completely random way. Does anybody know the reason for this (if there was one)? Some of the posts on this site are critical of the role of the PTEs as bus operators – with reference to both their size and sometimes controversial liveries, although this is clearly a subjective matter. The PTEs have stood the test of time, despite the upheavals since 1969 in both the bus industry and local government, but it is interesting to speculate on what might have happened if they had been just coordinating bodies from the outset, with the bus operations left in the hands of local authorities. After all, there was already a great deal of joint operation in the area which became Greater Manchester, between the various municipal operators and between them and the company operators Ribble, LUT and North Western, and it seems that little was gained by creating a mega-operator with over 2,500 buses and standardised staff conditions etc. In 1974, local government reorganisation would have seen mergers between Wigan and Leigh, Bury and Ramsbottom and between Ashton and SHMD, maybe each with a new livery. While the last-mentioned would have been a merger of equals, no doubt the other two would have been seen locally as “takeovers”! This would have left Trafford as the only non-operating district. What would have been the implications of this? Geoff, a very interesting post which raises the potential of many hypothesis. When Henry Mattinson established the Express Services in the late 1920s he prefigured SELNEC/GMT by 41 years and had he not died prematurely he may well have been able to both defend the services against the railways, taxi drivers and haulage companies and restructure the routings through the city to avoid Market St and the congestion thereon. There is some evidence that he had some form of deeper integration in mind. His successor, Stuart Pilcher, had other fish to fry but Henry’s far-sightedness led to an unprecedented co-operation, through running arrangements and revenue sharing which, by 1968 had become somewhat unwieldy, especially in terms of mileage sharing, fare structures and revenue split. Whatever the political motives behind the formation of the PTEs were, there was a sound economic, operating and purchasing reason to pull the bus operations in the conurbation together, local pride and the views of enthusiasts were a long way down the list of priorities. In effect the job was incomplete until GMT pulled in Wigan, LUT and the share of North Western. In GMT times, especially under Labour, there was a definitive drive to finalise what had been started over 10 years previously and to give the operation an identification with Greater Manchester in a similar way to that which had been the case when the pre SELNEC operators served there own areas. The SELNEC/GMT "standard bus" carried forward the well proven Manchester ideal of trying to achieve cost savings and spares rationalisation – though, as ever, there were a large number of deviations. The anomaly of Trafford not having an operator within its boundaries arises from the fact that, from tram days, MCTD had set itself up in competition with the Manchester, South Junction and Altrincham Railway which served Altrincham and, by default, Stretford and Sale on the way. As the route to Altrincham was the only real money spinner in the area, there was little room for the boroughs that now form Trafford to become involved, Manchester and North Western serving the branch routes off the A56. The history of Manchester’s tram and bus operation along the A56 is littered with obstruction from both Stretford Council and the railway so there is no doubt that any operator set up by Altrincham, Sale or Stretford would have had problems both with each other and certainly with Manchester, though the problem never arose as even an SHMD type operation between the towns would have had few viable routes. Had SELNEC/GMT never appeared, presumably after 1974, Manchester Corporation would have continued its presence in the Trafford area, as would NWRCC. Phil The idea of a single operating authority was also discussed in West Yorkshire in the thirties when the then Leeds manager W. Vane Morland suggested a PTE like organisation. One factor at the time which put brakes on the idea was the high degree of railway involvement in several of the operators. It is also interesting that from 1974 when the later PTEs were set up no more large NBC companies were dismembered. The companies based in the new West and South Yorkshire PTEs all had clearly defined territories where in the main the old municipal operators did not run except on joint services, indeed although West Yorks PTE was based in Wakefield it ran no services there. But oh how I wish LUT were still in existence! I live in Wigan & when I was a youngster used to have a fleet list (don’t have it anymore). I seem to recall that all the buses were numbered 1 to 150 & so each new bus took the number of one retired. Hence over time the numbering appears to be completely random. I used to drive, as a casual driver for Ribble Motors in the 1980’s, and believe it or not, the height warning in the cabs of the Leyland Nationals indicated that they wouldn’t fit under the bridge in Mill Lane, but they always did. JUST! When Red Bridge, at Standish Lower Ground still had its top span on, the newer double deckers that Wigan Corporation ran, wouldn’t fit under it. Only the older ones with the flatter tops would. So the newer ones always had a warning in the cab about this. Imagine my surprise when I was waiting for the bus in Shevington, to go to school round about 1957, and a newer bus arrived to pick us up. I said to my mate, "this bus won’t fit under the bridge" He told me not to be so stupid. Guess who was right? I know the Dangerous Corner references are nearly 2 years old, but I have only just seen them. As well as Dangerous Corner on the A5209 near Wrightington, there is also a place with that name on the A577 near Atherton, I wonder if Wigan would have had that as a destination as well. There is even a 3rd location with that name, it is in Yorkshire on the A59 near Menwith Hill though I can’t see that one appearing on a bus blind. The reference to pigeons reminds me of a certain inspector at a certain underground (well, under-carpark) coach station in Manchester who did not like passengers who asked an excessive number (i.e., 2+) questions. He carried a pocket full of bird seed and would quietly stroll behind said passenger, scattering the good seed as he went – the resulting flocks of pigeons soon sent the passenger on their way! I don’t think Wigan Corporation ran to the Dangerous Corner on the A577 near Atherton but Leigh Corporation certainly did and carried that destination on their blinds. With the "home made" style radiator grille, it looks as if it has had a more serious encounter at "Dangerous Corner" – this one or somewhere! True, Michael- or was it cross-bred with a Guy – a Leyland Arabic? I’m surprised no one has mentioned that this was one of the last Massey built bodies as Northern Counties took over in 1968.